Working in groups can be tricky: messy schedules, conflicting personalities and divergent ways of thinking can obstruct progress. Tech’s Senior Capstone Design class encourages teams to utilize their strengths instead of their weaknesses to produce something that showcases their many talents. Students who graduated in December had the chance to share the fruits of their Capstone Design projects on Dec. 6 in McCamish Pavilion. 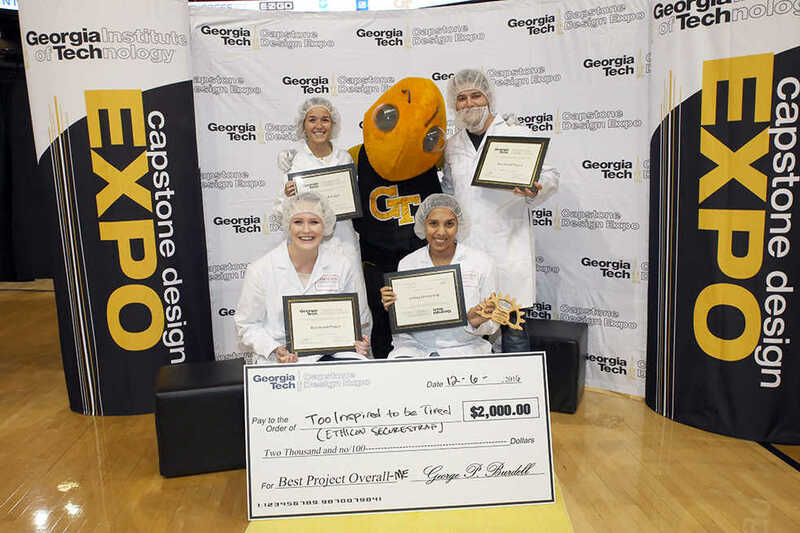 Innovators competed to be declared the best project from their major, and to win an overall prize of $2,000. This year’s overall winner was a team of mechanical engineers that call themselves “Too Inspired to be Tired.” The four students who worked on the victorious team were Neha Sinha, Joshua Bobo, Hayley Snyder and Corinne Maxey. “By the time they got around to announcing winner we thought there was no way we could win. It was super surprising,” says Neha Sinha, team liaison. Ethicon, a subsidiary of Johnson and Johnson and the team’s sponsor, is the producer of the SecureStrap, a suture device used by surgeons in laparoscopic hernia repair. The team realized that there needed to be a faster and more efficient way of manufacturing the SecureStrap, so “Too Inspired to be Tired” set out to create a machine that would safely produce this device in less time. The team faced several challenges along the way. Their group was smaller than the average Capstone Design team, which sometimes required members to spread themselves thin and take on extra work. In addition, they had to make sure that the product complied with FDA regulations, and the team had to learn a lot about topics they weren’t necessarily famiiar and comfortable with. “There was a lot of electrical wiring and programming necessary to automate something, which is not a huge part of the ME program, so we had to learn as we went,” Sinha said. Instead of simply automating the process, “Too Inspired to be Tired” worked on making manufacturing process improvements, such as swapping an inefficient rubber band for a cap that could be reused. Ethicon is already implementing the team’s cap design and process improvements. The project was a relief to finish, and when it came time for the Capstone Design Expo, the team was proud of this end product. “I love talking to people, and the people on our team were able to communicate our project really well,” Sinha said. She thinks they were successful because the project was relatable and understandable, and the applications could easily be seen. In addition to the overall prize, awards were given out for each engineering discipline. Aerospace engineering produced winner “Impact,” an 11-person team that constructed a Cubesat mission to Mars’ moon Deimos in order to determine its origins. “CathART” won the biomedical engineering category, showing off an assisted reproduction catheter that increased device effectiveness and decreased patient pain. Electrical and computer engineering students from “Raising the Steaks” won their category with the creation of a drone-mounted RFID scanning process that takes inventory of the cattle in a herd. “Eggwash,” an industrial design team, created a seating device that allows elderly and other disabled individuals to shower more easily and safely. The winner of the industrial and system engineering category was the “Wrigley’s Lifesavers Project,” who attempted to help Wrigley eliminate manufacturing bottlenecks. “Great Clips” dominated the mechanical engineering category by creating a device that safely helps railroad workers apply railroad elastic fastener clips. The interdisciplinary group “PH571” aimed high and attempted to build a vehicle that would be top of the field in urban commuting, long-range travel and performance driving. Too Inspired to be Tired has now scattered and members are pursuing various careers. Their work will continue to be used and will impact manufacturers, operators and patients in future years.